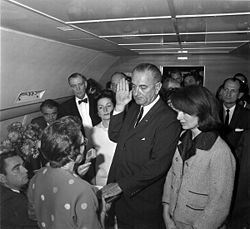 Former U.S. President Lyndon Baines Johnson takes the oath of his office with his left hand on a Bible. Civil religion is the folk religion of a nation, often involving ritual expressions of patriotism. It is frequently given merit by leaders within a society, for example with the invocation of God in political speeches or religious references relating to patriotic holidays. 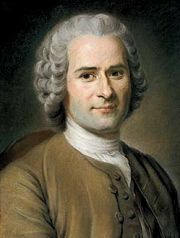 In 1763, Jean-Jacques Rousseau coined the term "civil religion" in his The Social Contract, to describe what he regarded as the moral and spiritual foundation essential for any modern society. In the 1950s and 1960s, scholars studied civil religion as a cultural phenomenon, attempting to identify the actual tenets of civil religion in the United States of America, or to study civil religion as a phenomenon of cultural anthropology. As a defining factor in civil religion, the term "Judeo-Christian tradition" refers to the several types of monotheism practiced in the United States and Europe, based on the assumption that these faiths all worship the same God and shared similar values. There is therefore a purely civil profession of faith of which the Sovereign should fix the articles, not exactly as religious dogmas, but as social sentiments without which a man cannot be a good citizen or a faithful subject...The dogmas of civil religion ought to be few, simple, and exactly worded, without explanation or commentary. The existence of a mighty, intelligent and beneficent Divinity, possessed of foresight and providence, the life to come, the happiness of the just, the punishment of the wicked, the sanctity of the social contract and the laws: these are its positive dogmas. Beyond that, Rousseau affirmed that individuals' religious opinions should be beyond the reach of governments. However, he believed that the punishment for violating the dogmas of civil religion for one who has affirmed his commitment to them ought to be death because: "he has committed the worst of all crimes, that of lying before the law." As the term is used today, civil religion is not a formal or official creed. Indeed, the dogmas of a particular society's civil religion are often hard to define or even recognize. 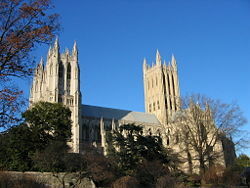 The Washington National Cathedral in Washington, D.C. is often used for state funerals for political leaders. 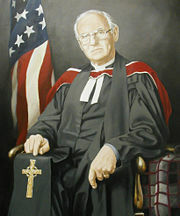 The Reverend Dr. George MacPherson Docherty, a principal instigator of the addition of the words "under God" to the Pledge of Allegiance to the Flag of the United States. Thus, even officially atheistic governments such as those of Cuba, North Korea, or the former Soviet Union may be said to practice an atheistic form of civil religion, with saints and mythologies of a Marxist ideological character. 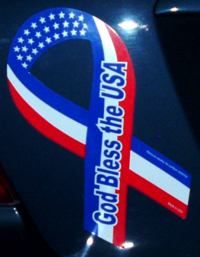 Magnets on automobiles became a popular way to display patriotism in the United States during the 2004 elections. "American civil religion" is a term coined by sociologist Robert Bellah in 1967. It sparked one of the most controversial debates in United States sociology, resulting in American civil religion being studied relatively thoroughly. The United States was settled in part by religious dissenters from the established Church of England, who desired a civil society founded on a different religious vision. Consequently, there has never been a state church in the United States and individual state churches have not existed in the United States since the early nineteenth century. Religious denominations compete with one another for allegiance in the public square. These facts have made public displays of religious piety by political leaders important to a large sector of the population; lacking an established church, they need public assurance of those leaders' religious beliefs. Bellah argued that America has experienced three periods of crisis when a large number of Americans were cynical about the American creed. When "the spiritual glue that had bound the nation together in previous years had simply collapsed." The founding of the nation is the first period, since it was by no means clear that the American people could actualize the American creed. The Civil War and the 1960s were the other two periods. Bellah and fellow scholar Martin E. Marty studied civil religion as a cultural phenomenon, attempting to identify the actual tenets of civil religion in the United States of America, or to study civil religion as a phenomenon of cultural anthropology. Marty wrote that Americans approved of "religion in general" without being particularly concerned about the content of that faith, and attempted to distinguish "priestly" and "prophetic" roles within the practice of American civil religion, which he preferred to call the public theology. Bellah wrote that civil religion was "an institutionalized collection of sacred beliefs about the American nation." He identified the American Revolution, the Civil War, and the Civil Rights Movement as three decisive historical events that impacted the content and imagery of civil religion in the United States. He also identified several modalities within U.S. civil religion related to the biblical categories of the priesthood, prophets, and wisdom tradition. Civil religion can be problematic from a theological perspective. Being identified with a political culture and a leadership hierarchy of an existing society, civil religion can interfere with the prophetic mission of a religious faith. It is hard to make civil religion a platform for rebuking the sins of a people or its institutions, because civil religion exists to make them seem sacred in themselves. An exception to this can be seen, however, when a leader such as Martin Luther King, Jr. effectively invoked American civil religion against the sin of racism. "I have a dream," he famously said, "that one day this nation will rise up and live out the true meaning of its creed: 'We hold these truths to be self-evident, that all men are created equal.'" Earlier, Abraham Lincoln likewise had invoked the Declaration of Independence's same famous phrase in his Gettysburg Address during the American Civil War. The assertive form of civil religion in America is an occasional cause of political friction between the United States and its allies in Europe, where civil religion is often relatively muted. 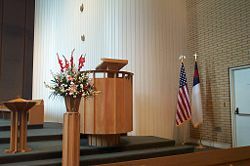 In the United States, civil religion is often invoked under the name of "Judeo-Christian tradition," a phrase originally intended to be maximally inclusive of the several monotheisms practiced in the United States, assuming that these faiths all worship the same God and share the same values. This assumption tends to dilute the essence of both Judaism and Christianity; recognition of this fact, and the increasing religious diversity of the United States, make this phrase less heard now than it once was, though it is far from extinct. "The greatest part of...America was peopled by men who...brought with them into the New World a form of Christianity...by styling it a democratic and republican religion. "—Alexis de Tocqueville.